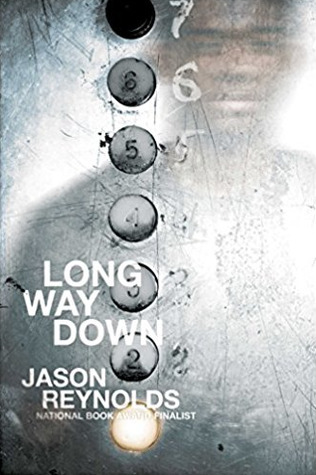 Written in staccato-rhythmic poetic verse, Jason Reynold's ninth novel, Long Way Down is a short, young adult novel that leaves a lasting impact. Reynolds tells the fictional, yet realistic, story of William Holloman. His brother, Shawn, is the recent victim of gun violence. In an effort to follow unwritten protocol in his neighborhood, William finds his brother's gun and sets out to get revenge. On his way to do what he feels he is required to do, he gets on the elevator of his building. As it goes down, William meets someone on each floor who helps widen his perspective. Because the story is written in verse, the pages turn quickly. I found myself struggling between savoring the creative crafting of the story but also gulping the content in a rush to get to the end and find out what happens once that elevator reaches the bottom level. After finishing the novel and learning more about Mr. Reynolds, I definitely want to read more of his work. 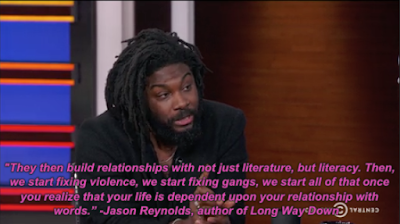 He has a new and refreshing take on how we can use classic literature and pop culture in tandem to get more young people, especially boys, to read and read more. Be sure to check out his interview from Jan. 23, 2018 on The Daily Show with Trevor Noah. Recommendation: This book is a very quick read. Most people could finish it in a day, probably just a couple of hours. But don't be afraid to go back and read it again. It is short, but also deep and complex. Reynolds' approach to writing stories for the underrepresented is noble. However, this book could (and should) have an emotional impact on any reader!